Finally this project took off and I am quite happy with the result. 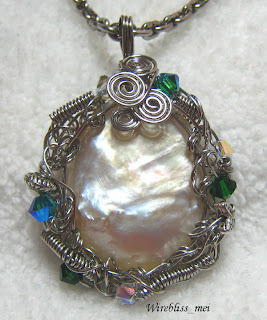 This entangled wire bezel pendant is based on Lisa Niven's tutorial in Step by Step Wire Jewelry Summer Preview 2007 Issue. The mother of pearl cab measures about 1.5in x 1in. The swarovski crystals used are 4mm in size while the wire for weaving is 26g. I can wear this one whole day and everyday of the year. Planning for some more similar projects but on different stones/beads. 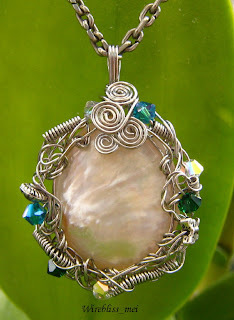 This project is fun to make as the wire wrapping/weaving depends very much on your own imagination and there is no wrong or right as to where you want your wire to go or how you want to wrap it around the bezel. I like it. Nice change of bezel. Thanks for looking Adam, anonymous. Hi! I've posted up some pictures of my jewelry projects. I'm still a beginner so they are rather simple. Don't expect a full array of wire bezels like the one you did though. Haha.